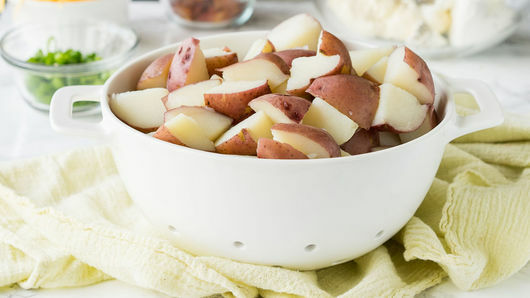 Place 3 lb red potatoes, cut into 1/2-inch pieces, in large pot; fill with water until potatoes are just covered. Add a tablespoon of salt to water, if desired. Heat to boiling; simmer 7 to 9 minutes or until potatoes are fork-tender. Drain potatoes; rinse with cold water until cool. Set aside. 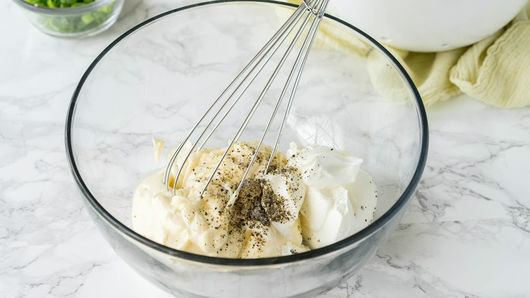 In large bowl, beat 1 cup mayonnaise, 1/2 cup sour cream, salt and pepper to taste with whisk until smooth. Add cooled potatoes; stir to coat. Add 1/3 cup sliced green onions, 8 slices bacon, cooked and crumbled, and 1 cup shredded Cheddar cheese (4 oz). Gently stir to combine. Cover and refrigerate until ready to serve. Quickly cool down the hot potatoes by submerging them in a bowl of ice water, then drain. 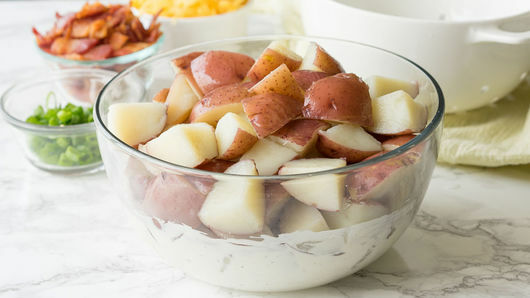 Add a little zip to your potato salad with a few dashes of hot sauce to the mayo and sour cream mixture. You love loaded baked potatoes (and really, who doesn’t? ), and you love a classic potato salad—so why not have both? 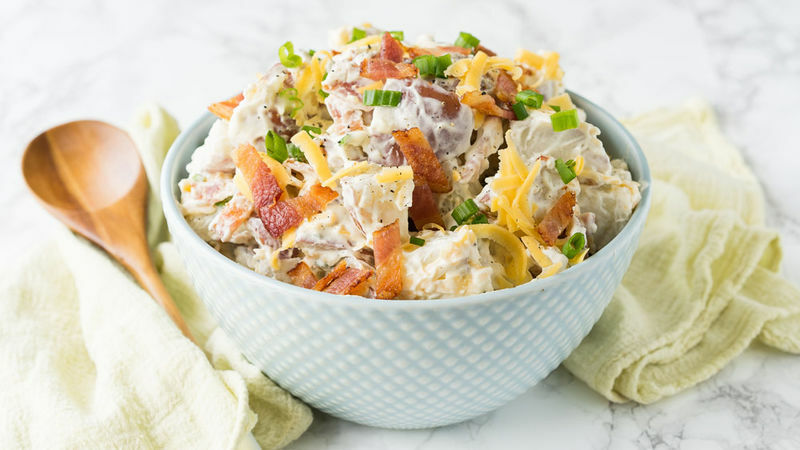 This recipe loads your potato salad up with bacon and cheese, just like your favorite way to eat a baked potato! If you’re interested in a real spin on this version, try using a seasoned sour cream instead of the regular half cup the recipe calls for. Another way to make it different is to swap out the type of cheese you use. This recipe calls for Cheddar, but Monterey-Jack, Colby or pepper jack are flavorful upgrades! Once you try this spin on potato salad, you likely won’t try another version ever again. But in case you like variety, we have plenty of other potato salads for you to try including the classic version.